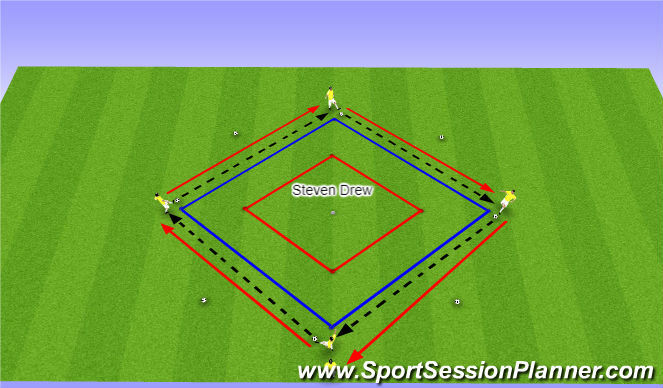 Football/Soccer Session (Academy Sessions): GK Distribution with feet. A distribution with feet session which compliments a number of match-related scenarios in a technical/technical skill setting. (GK, 2x CBs, DM + CM). Goalkeepers (GKs) will have the opportunity to the fundamentals of the switch of play pass (short and driven), bounce pass and penetrative pass. -Passing- short pass(side of foot)/driven pass (use of laces), use of both feet, switch of play & bounce passes. Detail: type/weight/accuracy of pass. -Receiving- side foot, touch out of feet (in to the direction of the next play), receive ball on back foot (open body position). -Psycho/Social- confidence building (using weaker foot), Communication; verbal/non verbal. -Area is made up of 2x diamonds - 1x red and 1x blue. Dimensions of the area will be determined by the appropriate needs of the GKs. -Red diamond will be placed inside the blue diamond. 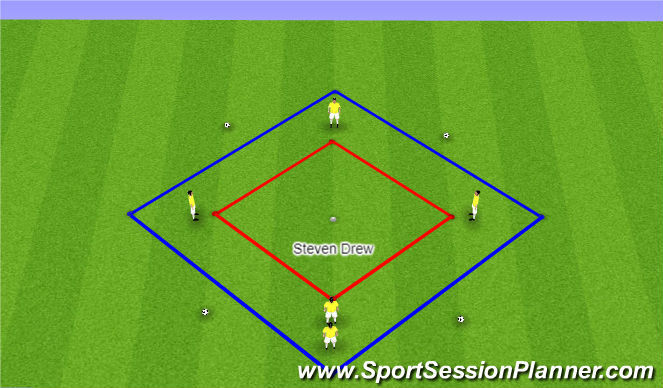 -Equipment- 9x spots/cones (4x red and 4x blue and 1x white), supply of footballs (situated in various areas of the set-up). Within this exercise set-up, the following variations can be applied easily. 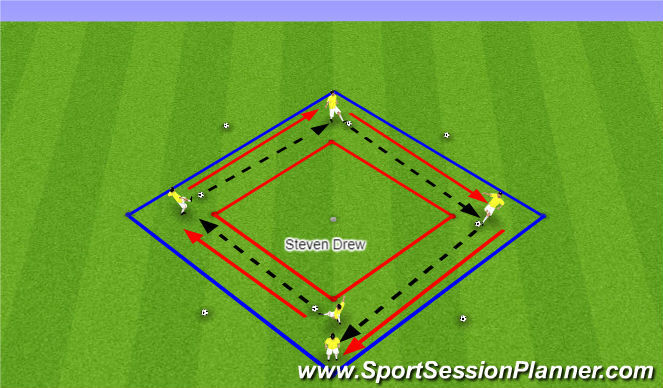 1) Switch of play around the red diamond. 2) Switch of play around the blue diamond. -GKs can also play passes opposite them (passive pressure, follow direction of the pass etc). 3) Bounce pass, switch of play and penetrative pass. -Spacial Awareness- a follow-up of the open-body position element; encourage GKs to scan the pitch in order to decide where the GKs next passing option is. -Supporting Movements(? )- when GK completes the pass, provide support for the player on the ball (positive match habit). -GKs work in a group of 5 or 6. -1x GK on each spot. 2x GKs will double up on a spot (this will be the starting point of the exercise). -GK plays the ball to either their left or right (GK follows the direction of their pass). -For this sequence, the GKs will perform short passes and aim to apply the key elements of an open body position (to receive on their back foot), use of both feet to pass and receive the ball and apply their first touch out of their feet to play their next pass. -Diagram shows exercise being conducted with 5 GKs; if set-up has 6 GKs - 2x GKs on 2x spots (standing opposite each-other) with a ball. GKs play in the same direction (left or right) so exercise has 2 footballs going at the same time. -GKs pass in the opposite direction (clockwise/anti-clockwise). -GKs move to the blue spots in order to pass over a bigger distance (encourage GKs to apply the driven pass - when/why you would use this technique etc). -Coach/designated player has the opportunity to dictate the drection of play. -GKs who passed the ball last can apply passive pressure on the GK who has just received the ball. -GKs can pass in any direction (apply passive pressure and follow in the direction of your pass). -For this sequence, the GKs will perform driven passes and aim to apply the key elements of an open body position (to receive on their back foot), use of both feet to pass and receive the ball and apply their first touch out of their feet to play their next pass. -Coach/designated player has the opportunity to dictate the direction of play.